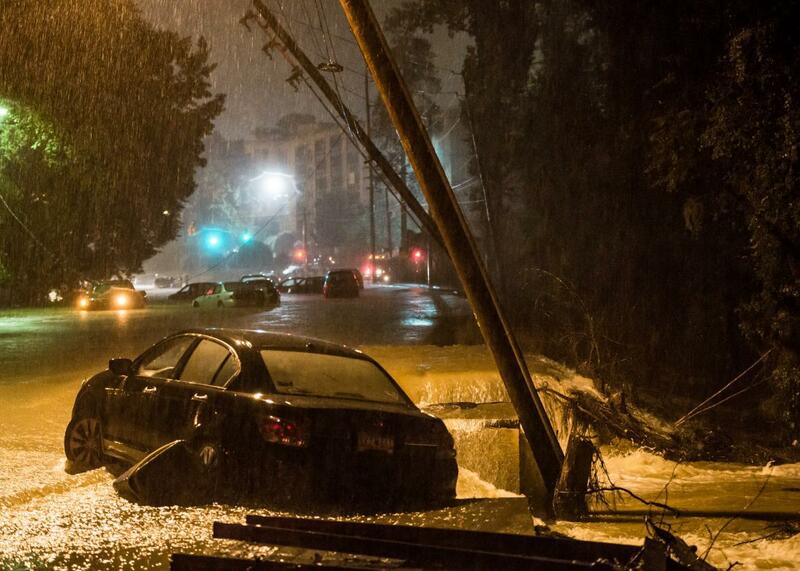 South Carolina floods hit Charleston and Columbia hard. 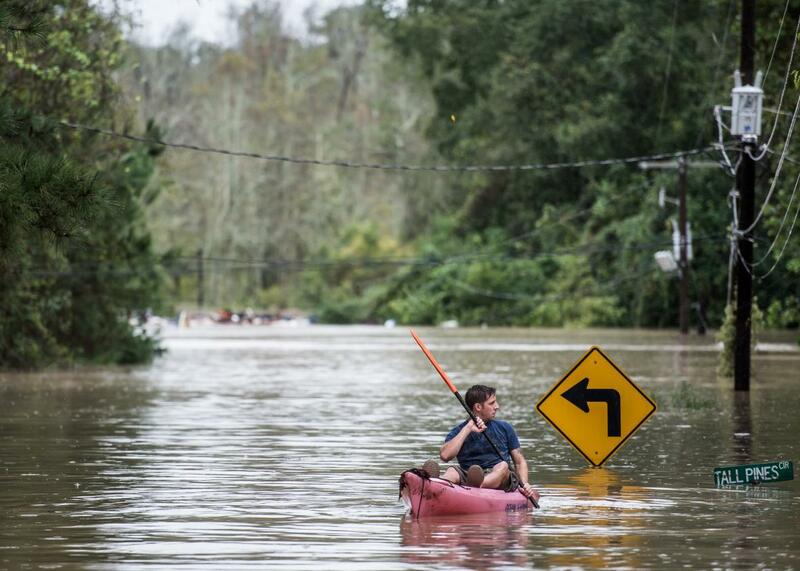 A man kayaks on Tall Pines Circle on Oct. 4, 2015, in Columbia, South Carolina. Much of South Carolina remains at a standstill on Monday as one of the worst flooding events in U.S. history continues to unfold. Truly stupendous amounts of rain have fallen, and state officials estimate that more than half of South Carolina is currently underwater. And it’s not over yet: The water level in major rivers will continue to rise for most of the week as runoff from tributaries upstream slowly makes its way to the Atlantic. The Associated Press reports at least seven deaths have been blamed on the storm so far. Police in Columbia, the state capital, planned fresh door-to-door checks on Monday, marking a fluorescent orange X on houses as they go—harkening back to the aftermath of Hurricane Katrina in New Orleans 10 years ago. An abandoned vehicle sits in flood water the morning of Oct. 4, 2015, in Columbia, South Carolina. 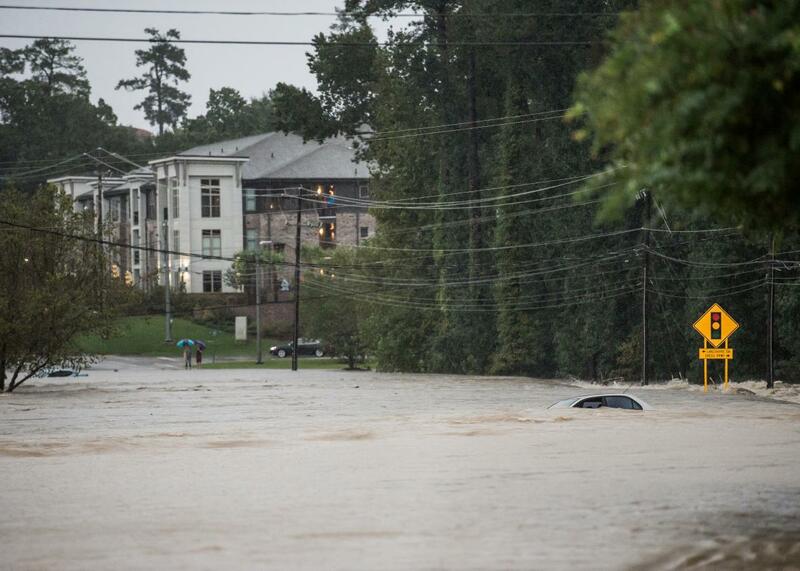 Flood waters engulf an abandoned vehicle on Forest Drive on Oct. 4, 2015, in Columbia, South Carolina. Even with all the warnings, Sunday was a day filled with harrowing rescues statewide. At one point, the city of Columbia said 200 high water rescues were “pending.” Columbia’s fire department dispatched officers to homes, trees, and cars, and in one case, a helicopter was sent to rescue a firefighter who himself became trapped in the high water. In Charleston, the Coast Guard—which normally responds to distress calls at sea—was performing rescues over land. The flooding was worsened by several dam breaches across the state. At one dam near Greenville in the western part of the state, water was flowing through the spillway at more than a thousand times the normal rate. As of Monday morning, the National Weather Service said that event was finally waning. The true amount of rainfall and flooding may never be known. In one example, the USGS water level gauge measuring Gills Creek in Columbia stopped measuring at more than 10 feet above flood stage early Sunday. A later statement from the National Weather Service confirmed that the gauge had been washed away. The flow of the Congaree River through downtown Columbia peaked at four times the historic maximum before its gauge also appeared to fail early Monday. 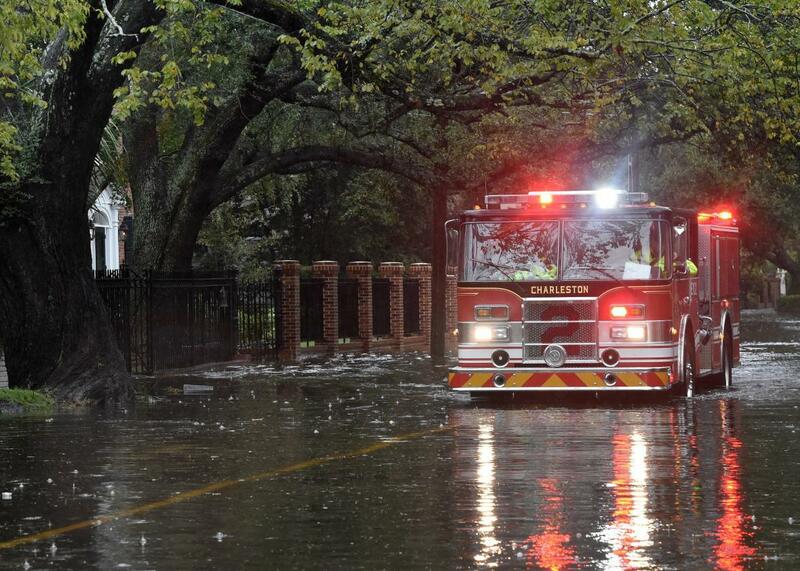 A fire truck performs a safety check on a flooded street in downtown Charleston, South Carolina, on Oct. 4, 2015. Many official weather observers across the state also reported difficulties measuring rainfall during the height of the storm because it was falling so fast. Where gauges held out, like at the airport in Charleston, nearly every standing rainfall record was broken, including a new monthly rainfall record in less than four days—racking up a total that eclipsed some of the worst flooding events in U.S. history. Sadly, this is exactly the type of event we can expect to see more of as the planet warms. One of the most straightforward responses to climate change is a quickening of the hydrologic cycle: Warmer air speeds evaporation and can cause rain to fall with greater intensity. This supercharges the atmosphere, and boosts the likelihood of devastating floods. What’s less clear is how many of these events it will take—major floods also hit China, France, and Guatemala over the last week, with more than 100 dead—before we start bending the global emissions curve away from a worst-case climate scenario. 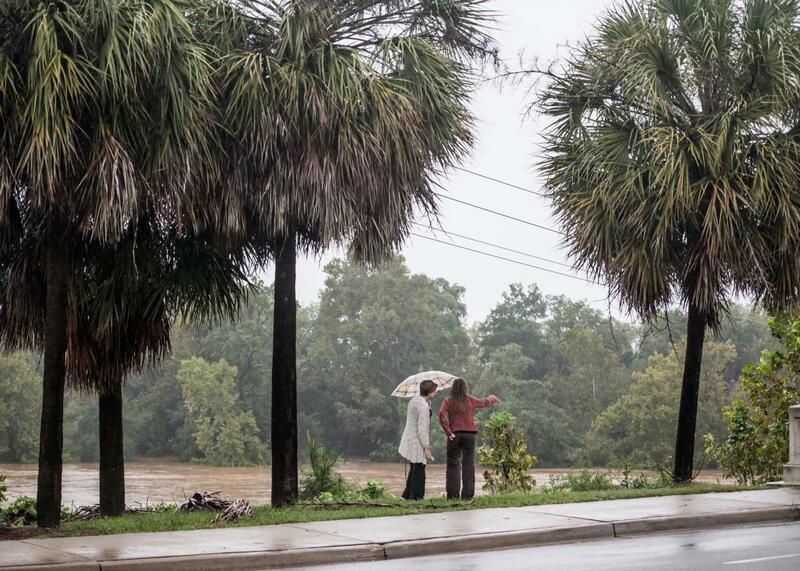 Two women look out over the rising waters of the Congaree River on Oct. 4, 2015, in Columbia, South Carolina.